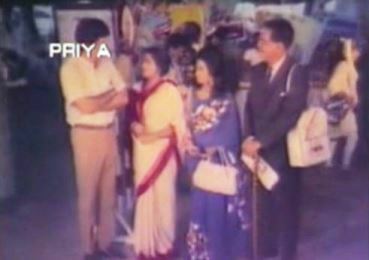 A lot of my memories of 50s and 60s cinema date back to the 1980s, when almost all the films I watched were those shown on Doordarshan. 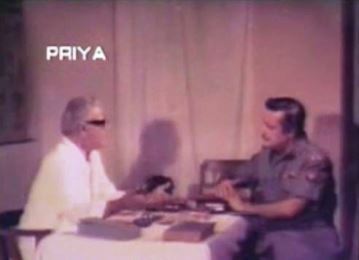 In the early years, with Doordarshan being the sole channel, my sister and I (our parents were rather more discerning) watched every single Hindi film that was telecast, down to painful stuff like Jai Santoshi Ma and the thoroughly obscure Fauji, with Joginder Singh (who, if I remember correctly, also produced and directed it) in the lead role. But, to get around to the topic of this post: Abhilasha, not a very well-known film but one which made an impression on me because of two songs I liked a lot. And because it depicted a mother-son relationship that was a little different from the usual. That was all I remembered of the film, but I’d been wanting to watch it ever since. Fortunately, it’s now available on (a sadly scratchy) VCD by Priya, versions of which are to be found on Youtube. The film begins at a party at the home of Brigadier Ranjit Singh (Rehman) and his wife Meena (Meena Kumari, in an awful wig). While their parents dance and chat, the children gorge on ice cream and look on. Meena, going to a little girl, gathers her up in her arms, rubs away the melted ice cream smeared over the kid’s face, and generally coos over the child. Ranjit glances towards them, and there’s an exchange of understanding smiles. It’s a sweet little domestic scene. Except, as it turns out moments later, this isn’t Meena and Ranjit’s child. She’s a guest’s daughter. Ranjit and Meena don’t have any children. There is, too, a sad tale behind that. Meena had given birth, and one day, playing on the rooftop with her baby, tossing it up in the air, she had tossed it right over the parapet [Yes, just the thought of it makes my hair stand on end, so you can imagine what it does to Meena]. Meena, no matter how much she is told that it was an accident, cannot forgive herself. This, says the doctor to whom Ranjit takes Meena for a gynaecological examination, is the cause of Meena’s inability to conceive. She has convinced herself she can never be a good mother, which is why she is unable to conceive. Until Meena can forgive herself and accept that she can be a good mother, the chances of her conceiving are slim. One evening, while some friends are over at their home, Meena receives the surprising news that Ranjit has been promoted to Major General, and has been transferred to Poona. While the sahibs and memsahibs are celebrating, Ranjit and Meena’s butler D’Souza (Harindranath Chattopadhyay, looking far too old—despite the black wig—to be husband to a relatively young woman) is in hospital, pacing about anxiously while his wife gives birth to a son. She dies soon after, and D’Souza is left—literally—holding the baby. That night, Meena hears the wailing of the baby from D’Souza’s little room beside their bungalow. He’s trying to quieten the baby, and the baby refuses to be quietened. Meena becomes increasingly distressed at the distress of the child, and finally rushes down and calms the baby. Then, realizing that D’Souza might not welcome this intrusion, she comes back to her room. But the baby starts crying all over again, and Meena goes all to pieces. Ranjit, unable to do anything to comfort her, takes matters into his own hands and goes down to D’Souza’s room. There, while D’Souza is blabbering apologies for the baby’s disturbing their sleep, Ranjit takes the baby from him and, having reassured D’Souza, takes the infant up to Meena. Within moments, her cooing to the baby, giving it its milk bottle, and singing to it makes the baby quieten down. 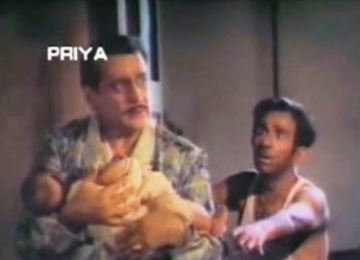 Ranjit realizes that D’Souza’s baby is a Godsend: the baby needs a mother, and Meena needs a child. If D’Souza—who anyway seems incapable of looking after the baby [though Ranjit is too tactful to say so] is amenable, can Ranjit and Meena adopt the child, bring him up as their own? D’Souza readily agrees; that his son be brought up as such a high-ranking officer’s, to be given the education and upbringing that will entitle him to a better life than his biological father can provide: what could be better? Ranjit also proposes that this remain a secret between D’Souza and the Singhs, and D’Souza agrees. So the baby becomes Ranjit and Meena’s son [it’s never shown how they account for the sudden appearance of this baby, though it’s possible that the shift to Poona might have helped]. Both Ranjit and Meena dote on him. … and then we flash-forward to 15 [or whatever; oddly enough, it’s not explicitly stated] years later. Arun (now Sanjay Khan) and Ajay (now Kashinath Ghanekar, who starred in the only Marathi film I’ve reviewed so far, Pathlaag) are—respectively—in the final year of BA and two years from becoming a doctor. They have been sent to the airport to receive Ranjit’s best friend, Rai Bahadur Daulat Ram (Murad), his wife (Sulochana Latkar) and their daughter Ritu (Nanda), who are returning to India after having spent the last 20 years in London. On their way home, Daulat Ram asks the young men what they’re doing; on discovering that Arun is in college, he asks Arun to get Ritu admitted to the same college. Ritu, being driven to college by Arun the next day, is puzzled (and piqued) by his reticence: is he always this quiet, she asks. Arun, unlike the outgoing Ajay, is the strong, silent type. Ritu is not; she’s vivacious and mostly feisty, giving back as good as she gets when someone in college pastes a cheeky note on her back. The only time Ritu is cowed down is when a group of young men gang up on her in college and start ragging her. To her surprise (and it seems, to his own) Arun springs to her defence and hits out at his classmates. It’s not long before Ritu and Arun have fallen in love, though it’s shown in an odd sort of way—choppy and not very coherent dialogues, long silences and what seems like friendly teasing, followed by the ethereal Waadiyaan mera daaman. Arun now shares a bit of news with Ritu: he’s off to Dehradun (presumably to the IMA) to join the army. He’ll be gone for two years; will she wait for him? Of course she will, says Ritu. And she will miss him every moment of every day. … a photograph her father finds and smiles at knowingly. He decides (in a discussion with his wife, and later, after talking to a shy Ritu) that he should talk to his friend Ranjit and fix up a match between Arun and Ritu. It’s almost time for Arun to come back, too, after getting his commission. (In the meantime, by the way, old D’Souza has died; Arun receives the news in a letter from home and is sad, but of course has no idea that the old man was his father). Back to Poona, where Ritu, now that she knows her parents know (and approve of) her love for Arun, is very happy. She goes on a drive with Ajay to the very place she had gone to with Arun just before he left. There, remembering her parting with Arun, she sings (imagining Arun beside her, no doubt) the same song he had sung to her. She’s unaware, all this while, that Ajay thinks her song is addressed to him. She is blissfully unaware, too, that he is in love with her and doesn’t have the slightest inkling that Ritu’s sweetheart is Arun. It seems Ajay isn’t the only one under the impression that Ritu is in love with him. When Daulat Ram and his wife come to Ranjit and Meena, asking for Arun’s hand in marriage for Ritu, Ranjit and Meena are surprised. They agree, but when they’re on their own, they puzzle over this: isn’t Ajay in love with Ritu? And Ritu in love with him? Ajay too receives a rude shock a few days later. While he’s been out, Arun has come home—and Ajay arrives to find Ritu and Arun sitting cozily in front of a fire, whispering sweet nothings to each other. His dreams are all shattered, but Ajay is mature enough to not show any trace of his disappointment when Arun meets him. Everything looks rosy for the young couple. Their parents are pleased; Ajay (whose feelings neither Arun nor Ritu are aware of) has reconciled himself to a life in which Ritu will be bhabhi rather than wife. The only obstacle is that since Arun has just got his commission, he’ll have to wait two years before he can marry—or he’ll need permission from his CO to marry now. Even that is, all said and done, nothing to be really worried about. After all, the CO may well give his permission. If he doesn’t, all they’ll have to do is be patient. But Ranjit Singh’s conscience won’t let him rest. This is a matter of marriage, of two lives—even two families—being bound together. It’s important that Daulat Ram (whom Ranjit knows to be a man very strict about ‘blood’ and ‘breeding’ and ‘lineage’) know the truth. Before he can tell Daulat Ram who Arun really is, Ranjit has to tell Arun the truth. It is the young man’s right [why Ranjit did not think it important to spring this on Arun earlier is anybody’s guess]. … and the truth, when revealed, shatters Arun. In ways, too, that Ranjit and Meena could not have imagined. Suddenly, from being the ‘well-bred son of a wealthy and esteemed Hindu family’, Arun has gone to being the poor son of a Christian servant. In his own eyes, and in the eyes of Ritu’s parents—who will no longer even dream of letting him anywhere near their daughter. Abhilasha doesn’t tread new ground when it comes to plot; this trope about the ‘high and low’, about barriers built by society, has been used in countless films, some good (Sujata comes to mind), many forgettable. Abhilasha manages to be, to my mind, somewhat in the middle. It has its good points and its bad. The somewhat unusual way in which the last half-hour plays out. True, there is a good bit of melodrama here (and a climax reminiscent of Sujata), but some of the conversations and the reactions came as a pleasant surprise. The fact, for instance, that Ranjit and Meena, even when they discover that Ajay loves Ritu, love Arun enough to not want him to give up his love for his foster brother. This love for one who is not of their blood, but still of their family, is one carried through very convincingly: even for Ajay, who is privately anguished, but outwardly happy for Arun and Ritu. Arun’s reaction to the news that he’s not whom he’s believed himself to be all these years is interesting (I won’t say good to watch, because Sanjay Khan does get rather hammy in these scenes). He goes to bits, and lashes out at both Ranjit and Meena, insisting on calling them ‘Sir’ and ‘Memsahib’ respectively, and letting them know that he is from now on never going to forget that he’s D’Souza’s son (he also rubs it in that if they’d told him the truth earlier, at least he’d have had the chance to treat his ‘real’ father with the respect he deserved—which I can understand). One especially poignant scene between Meena Kumari and Sanjay Khan where she tries to tell him that he is her son, no matter what, is memorable. And the music, composed by RD Burman to lyrics by Majrooh Sultanpuri. The sublime Waadiyaan mera daaman (the male version, by Rafi) is perhaps Abhilasha’s greatest claim to fame, but there are a few other songs that I like: the peppy Pyaar hua hai jabse, the lullaby/birthday party song, Munne mere aa sadke tere aa, and Ek jaanib shamm-e-mehfil. The stilted, not too convincing romance between Arun and Ritu, which is just pure badly scripted, with poor dialogues and sudden, unexplained falling in love, even though the film would have us believe it’s happened gradually. And, as I’d mentioned, the predictable, rather melodramatic end. Despite that, however, this, I thought, was a film that deserves to be better-known. It’s pleasant, the songs are nice, and the message is a sweet one. There are some tidbits about the film which I came to know, but did not include in my book as I could not get it corroborated. I suppose you mean about its being reused as Jete dao amay deko na? I have been listening to it, and I can somewhat spot the similiarity – but it’s sufficiently different from the original (I think) to be an altogether different song. 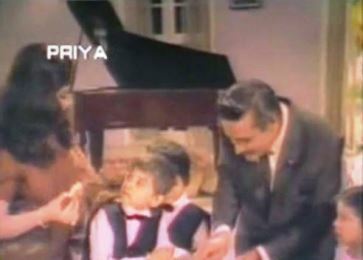 I think Yaaron hamaara kya was a delightful song, but so utterly wasted in Abhilasha – it has absolutely zero connect to the rest of the films, even down to being picturized on people who do not appear anywhere else in the film. Yes on both accounts. “Jeete dao amaye dekona” and “Waidyan mera daaman” I feel were composed simultaneously. Apprehend that “Jeete dao ” might have been rejected for the film leading RD to reuse the same phrase in the antara and create something which sounded very different. If you have a harmonium, would notice that the antara of “Jete dao” approximately falls in line with “Wadiyan mera daaman”. “Yaroon hamara kya” – I mentioned it had a low recall. Agha, Mohan choti and co do not create a great impact on the screen ;). This was like the item song in the film. In isolation, without the visuals, it sounds much better, as you tend to notice the arrangement. Overall, I liked the film. Saw it on VHS in 1988. 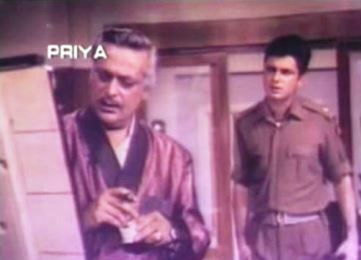 Amit Bose was a fine technician, but did not get proper opportunities after Bimal Roy passed away. He worked for sometime with Krishna Shah too. Maybe was paid well. I remember reading an article in a film magazine where he mentioned that he had graduated from the UK or somewhere in Europe. Very true. And, as you mention too, I thought it would probably be more appreciated in isolation. I thought it was going to usher in some other subplot in the film, so it didn’t rankle too much, and I did like the song. It was only when seen in the context of the film that it seemed pointless. It’s not a great film, Anu, and the end does get pretty melodramatic, but I found the treatment of some common plot elements refreshingly different from the usual. Arun’s foster family, for example, behaves in a way quite different from the ‘normal’, and even his own reaction to the truth is rather more human (more emotional, I’d say) than the type I’ve mostly seen onscreen. This review is better than the movie. Not a film I liked. Maybe I need to rewatch it. These generic melodramatic movies went into an overdrive between mid to late 60s and they were rarely good films and were generally south remakes. It was tough to endure the films of Nutan and Dilip saab from that period no matter how great the music they had. I would even say that the films from 1970-73 were better than 1966-69. Dharmendra’s filmography actually got better in the early 70s. The music was indeed the highlight, but I wasn’t aware that it was RDB! Maybe its because Rafi fans I’ve seen in various forums never mention the composer while praising ‘Wadiyan tera daaman’. even some youtube comments are like Rafi himself composed it. Yes, as I mentioned to Anu, it’s not a great film, but there are things (other than the music) about it that I liked – some plot elements which are treated slightly differently than the usual. 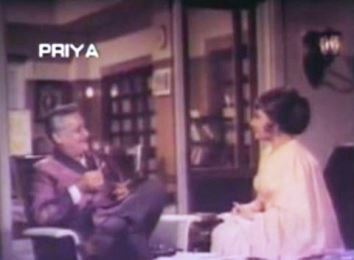 And don’t even remind me of the slew of OTT melodramas Nutan and Sunil Dutt acted in during the late 60s! Just the memory of films like Milan, Khaandaan, Meherbaan etc makes me shudder. Abhilasha is certainly not as melodramatic as those. LOL! Yes, I hadn’t realized, either, that RDB had composed it. Everybody raves about how fabulously Rafi’s sung it, but poor RDB seems to get no mentions at all. And the music is superb. I have completely forgotten this movie except the title (somehow all Doordarshan movie titles are somehow ingrained in my brain) and that RD Burman produced some great music. Both “Wadiyan Mera Daman” and “Pyar Huwa Hai Jabse” are songs that fail to fade away for me. Great review as always, and I feel it is better than watching the movie, especially tolerating Sanjay Khan who I am not so fond of. ..
Ah, we have finally found something to not agree about, Ashish! :-) I have a soft spot for Sanjay Khan, but that’s probably more to do with aeshetics than anything else – I find that boyish look of his appealing. His acting is average at best, though one of the most haunting scenes for me from old Hindi cinema features Sanjay Khan in his debut film – his final scene in Haqeeqat, which is really memorable. Yes, this is surely one where we disagree but there are few others (very short list though). Another one is Charlie Chaplin (I usually drop everything I am doing if his clip is playing) and I know you are not so fond of Charlie. “Harindranath Chattopadhyay, looking far too old—despite the black wig—to be husband to a relatively young woman”.. I don’t understand why directors don’t see such obvious oddities, I can’t imagine no one at the set wouldn’t have pointed it out.. It makes no sense for Harindranath Chattopadhyay to have been cast in the role of D’Souza. I mean, he’s so obviously old. At least Rehman looks a dignified middle-aged man in the first half-hour, so (also considering that he’s already been a father, of that baby who died), it’s believable. They could’ve easily have cast another character actor – someone middle-aged, who could’ve played a young D’Souza and transitioned into an older one with ease. Abhilasha is mainly remembered for its songs,particularly Pyar hua hai jabse and the twin versions of Wadia mera daman which are evergreen to say the least.Then also Ek jaanib. But their picturisation is not impressive especially pyar hua hai could have been much better done. I like the picturisation of Waadiyaan mera daaman, but yes, the picturisation of Pyaar hua hai jabse leaves a lot to be desired. Have you noticed how similar it is to Humdum mere maan bhi jaao? Barring the fact that Asha Parekh’s character there is huffy, it’s very similar – down to the men’s costumes and the masks. I share your assessment of the film, Madhu. Nothing great, but has a somewhat interesting perspective and lovely music. For me, the biggest weakness of the film was Sanjay Khan. His deficiencies as an actor really showed up in his emotional scenes with Meena Kumari who imbued her role with a complexity and depth of feeling far beyond what I’m guessing was in the script. I felt for her character; him not so much. You’re so right, Shalini. Meena Kumari really steals the scenes with Sanjay Khan: you can feel her frustration and anger and love for him very vividly. His acting is too hammy to do much for his character. I was wondering what it would be like if a better actor – say, Sanjeev Kumar, who was the right age then – had played the role of Arun. OK having now finished with my father’s blog, I hope to get some time, so you could say I am back in blogosphere. I will go through your other posts later. You know all the films of the 60s make me nostalgic, those days were quite simple, really. For one people talked, had conversations. Uh Oh, what am I doing going off the point. Coming to this film I remember the huge banners of this film, Meena Kumari’s melancholic face staring down at us. The film was a huge flop. The songs were hits, but now that you say that the message is a sweet one, I would probably give it a look , only problem, I just do not like Sanjay, he was yet to add the Khan to his name then. I am so glad you’re back in the blogosphere, Shilpi – and sorry, too, that your father’s blog is finished! (But I do hope if you unearth further things to share, you will reopen the blog). Meena Kumari didn’t look her best in Abhilasha, and the posters, the way you describe them, probably helped put people off from watching the film! I would certainly not want to see a film where it seemed a melancholic Meena Kumari was to be the highlight. It does get dreary and melodramatic towards the end, but it’s still an interesting take on families and what makes a family a family. And Meena Kumari’s acting is good (and not as tragic as in many of her other films). The temptation to continue is always there. Every time a film of my father’s is uploaded to you tube, I feel l like talking about it, for instance I found that Mehmaan was uploaded recently, I was tempted to discuss it, my father was a different kind of villain in that one, but then I thought it is better to move on in life now. I would like to now stay focused on my food blog and channel. Those days there were these huge hoardings or banners, that were painted and not printed as they are now. Artist Hussain started out as one hoarding painter.Seeing that huge melancholic face of Meena Kumari was enough to put one off. I know! And I have an interesting note to share on that. The painting of faces, especially, took effort because one had to get the features right – so a photograph from the film was used as a template, and a grid etched across it. Then each section of the grid (a manageable size) was replicated onto the larger hoarding. I actually own a lobby card of Talat Mahmood in Waaris, which has the markings of that grid across his face and shoulders. That is interesting. The best part used to be when we used to see my father’s face, most of the time it was perfect but sometimes it used to be not so perfect, actually sometimes a little funny. While moving around the city I have seen these artists with the film stills in one hand, balancing themselves up on the scaffolding, intently sketching the actors’ faces. As you were saying about the novel treatment of certain common plot elements, even today many directors make such changes in order to make the movie look ‘different’. It might not be the case with Abhilasha (for I haven’t seen it) but definitely they do not impress. A really good movie stems from its very conception in the mind of the director I guess. If we look at a movie like Musafir(1957) it might not have been lavishly produced but at least its original no? I haven’t seen Musafir, so I can’t comment on what you wrote about that (though it encourages me to watch the film), but somebody once did say that there are only a few plots, a few stories – less than a dozen, I think – and every writer (which naturally includes every scriptwriter) basically rehashes those. I don’t agree that there are so few stories, but yes, the number of stories is limited, so complete originality is very difficult to achieve. Especially in an industry which churns out so many films every year. And if, like me, one ends up watching so many films, one begins to see the same trope, the same plot elements, the same twists and turns, being played out in exactly the same way in film after film… in which case, even some deviations from the norm come like a breath of fresh air. Abhilasha was a bit like that – its treatment of a fairly common trope was quite different from other films of the period. I agree. I do think we tend to be more lenient when it comes to old movies. At least for me, it’s like “There’s so much other stuff that’s good about this, let me not crib about this and this and this…”! What a surprise finding your review here just when I needed it. I started watching this one oh, a month ago perhaps, got interrupted and never went back to it. Now that I have your review to read, I am sure it will double my pleasure. That’s a coincidence! Yes, do watch it, Neeru, and tell me what you think. It’s not a great film, not even a really good one, but I thought it showed the usual trope of foster family in a refreshingly different light. More real, I thought. Don’t think I am going to watch the movie. But thank you for the post because it brought back to memory all those fabulous songs. Yes, the songs are lovely – sad that only one should still be really popular (even Pyaar hua hai jab se isn’t heard as much as it should be). I completely got nostalgic after reading this Madhuji! mainly the mention of colored stripes, I got that image in front of me! I used to get angry if the movie doesn’t start on time! :-) True! Fortunately, they almost always did start on time.